To support education in rural India. 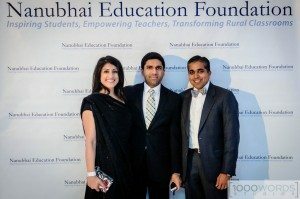 NEW YORK: The Nanubhai Education Foundation raised over $60,000 at its 10th anniversary gala, at 404 NYC, in Manhattan. Nita Nehru, Vic Muni and founder of the Nanubhai Education Foundation, Raj Shah. Photo courtesy of 1000 Words Studios Photography. The event, attended by around 300 people, was held to support programs for public education in rural India. Sakina Jaffrey, from the Emmy Award nominated original series, House of Cards, came to support the organization, along with Sheetal Sheth, best known for her role opposite Albert Brooks in Looking for Comedy In The Muslim World. Another big supporter was award-winning director and photographer Indrani Pal-Chaudhuri. The spokesperson for Nanubhai Education Foundation, actor Manish Dayal, best known for his role as Raj Kher in The CW series “90210”, also attended the gala. Dayal would soon be seen in his role as Hassan Kadam in the DreamWorks Studios film The Hundred-Foot Journey, directed by Lasse Hallström and produced by Steven Spielberg, Oprah Winfrey and Juliet Blake. The gala is the primary source to raise funds for the Nanubhai Education Foundation’s Scholars and Residential Teaching Fellows Programs, which focus on awarding college scholarships to girls from financially vulnerable families in rural India and building English speaking skills for students in rural boarding schools through native English speakers. “The support we received at the 10th annual gala is instrumental in allowing Nanubhai to distribute over 15 scholarships to young rural women to pursue higher education and complete a college degree. For the vast majority, they are the first of their family to go to college. This is a remarkable achievement and one that we all should be very proud of. By educating these 15 ladies, we are vastly improving not only their lives, but the lives of their future families as well, said Nita Nehru, co-chair of the Board for Nanubhai Education Foundation.